AARs: Show Us Yer Games! Posted: Tue Mar 20, 2007 12:17 am Post subject: AARs: Show Us Yer Games! 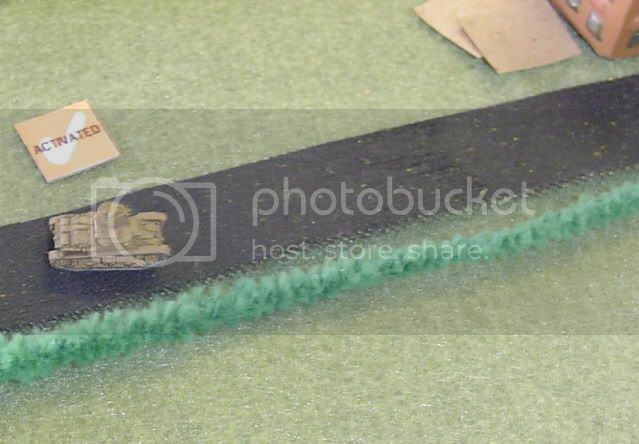 We have long-running threads on showing our models, our infantry, our scratch-builds, and even a 1-2-3 guide for painting. Several of us have done our own threads for various games we've had. But I say we should have one for showing lots of different games. C'mon, boys, show us yer games! Oh, well gee, if you insist, maybe I will. Here is a game I held a week ago at my home. I had only one other player, a buddy named Harold from Colorado, who was an Abrams TC in ODS. He and I had-at for several hours. We used the Mein Panzer beta update rules, which feature the fast-play of Mein Panzer tank and artillery rules while adding a faster version of squad-based infantry rules. I hope he enjoyed it as much as I did. 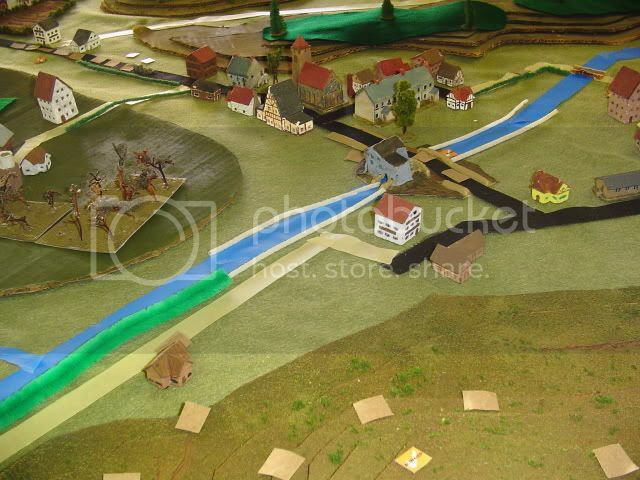 Our scenario took place in the French Alps in June of 1940. The Italians had crossed the boarder, and were advancing rapidly along the national highway that runs from south to north. 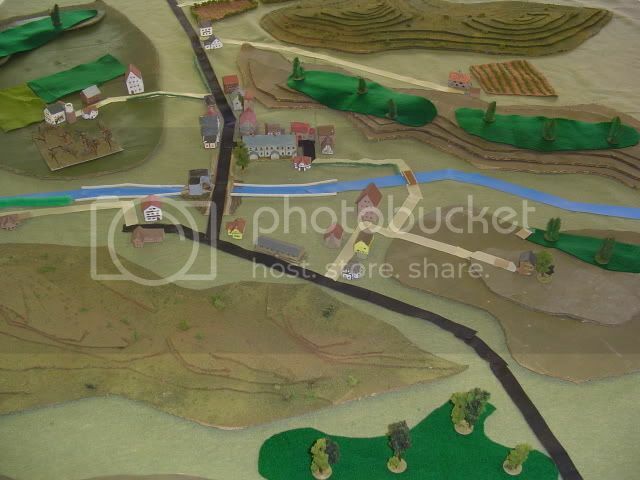 The French rushed a blocking force forward to the little village of Peinnin d'Asce, where a rapidly running mountain stream could perhaps serve as the basis for a defensive line. 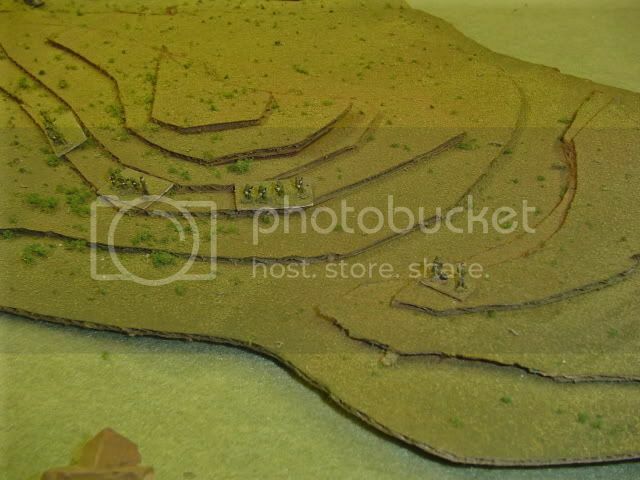 Each side built a force around a core of an infantry company. 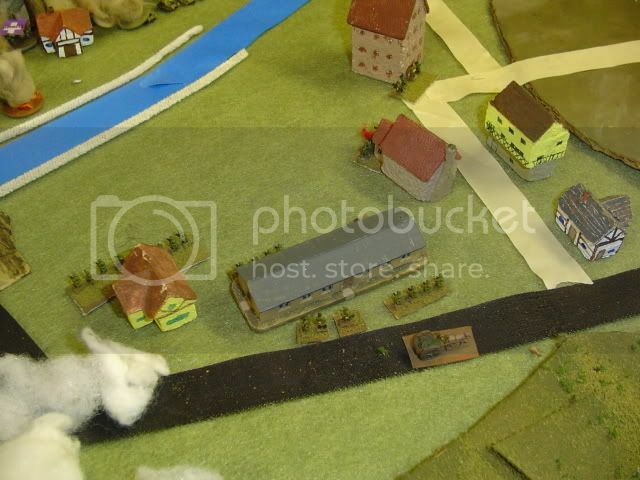 The French got a battery of 75mm guns, and the Italians a battery of 100mm howitzers for support. Then each chose a few attachements from a set of "available units". 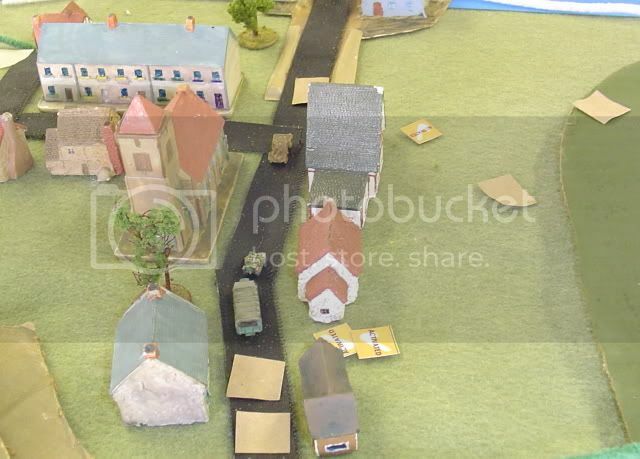 The French received an AOP, equipped with a land-line field phone, and a company CO with a couple vehicles. 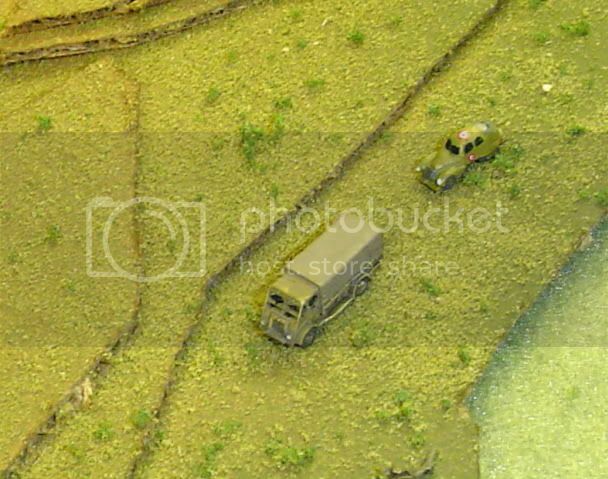 They also got to choose from a platoon of R35 tanks, a platoon of Panhard 178 AMD35 armored cars, two 25mm ATGs with emplacements, and a few heavy MGs with emplaced positions. 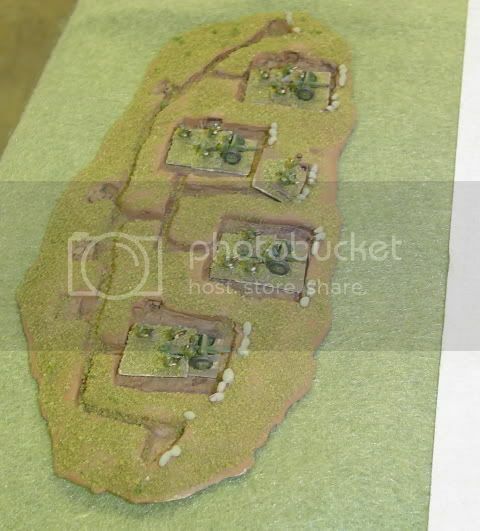 The French player (Harold) was limited to 20 stands total, not counting off-board arty, emplacements for ATGs and HMGs, or the two transports of the headquarters. The Italians received an AOP with a radio, and had a choice from up to two platoons of L3/35s, a platoon of L11/39s, a company command tank (either L3/35 or L11/39), a section of Ansaldo AB-40 armored cars, two 47mm ATGs, or several HMGs. 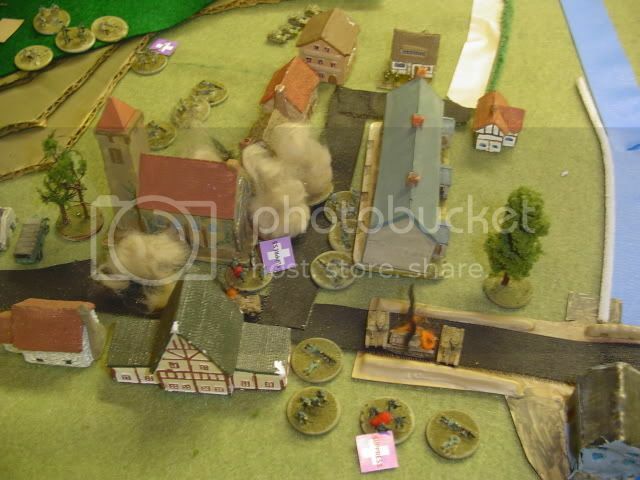 The Italian player (me) was limited to 25 stands total, not counting off-board arty and transports for all units. Either of us could trade away a few of the infantry stands to enable us to stay under our limit while completing a formation of attachments. Both knew what the other had to choose from, yet neither really knew what the opposition would have as we came onto the battlefield. As with all my games, we started with "chits", and only placed the models on the table as they were spotted under the rules. This is Peinnin d'Asce, in a long alpine valley of rolling meadows and scattered woods, as seen from the North. This is where the French chose to set-up their first line of defense. The stream here is rocky and fast running, and can not be forded. There are stone levy walls around the stream where it passes the village mill and goes under the main road bridge. 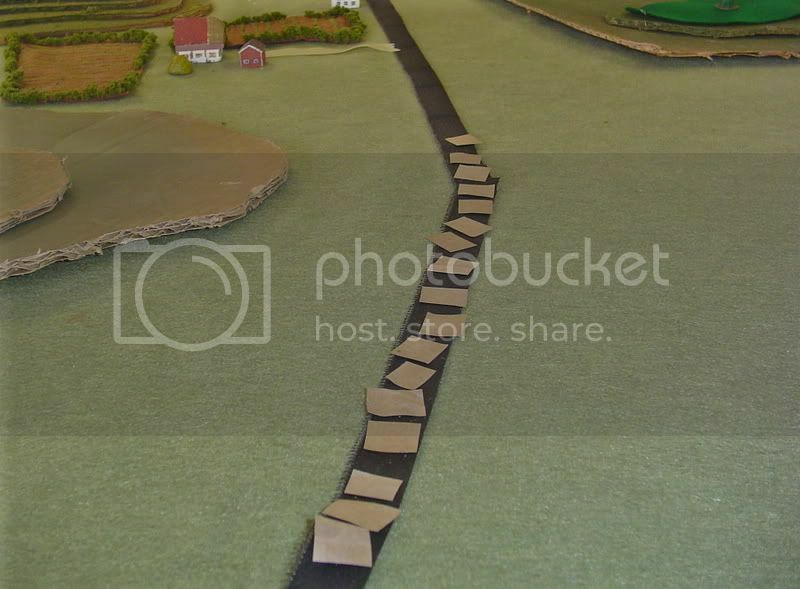 The national highway is the only paved road, entering from the NW on the near side, running up to the village, across the mill bridge, and then down straight to the S towards Italy. 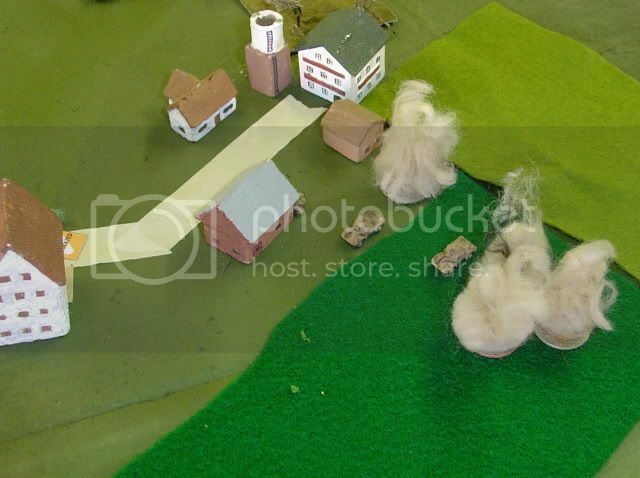 Most of the village is on the S side of the stream. There is a small wooden bridge about 1 Km W of the mill bridge. This structure serves the farm carts of the locals, but can not be relied upon to carry heavy vehicle traffic. Here come the Italians up the national highway. When using chits to keep the gamers "blind", this is the most nerve-wracking part of the game. Both sides are beginning to jockey for position. 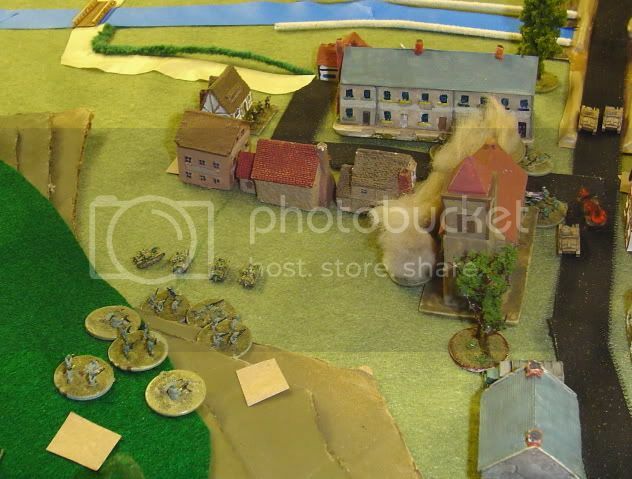 The French are spread wide, and can be seen moving a screen forward over both bridges. The Italians are staying on the road, at least for now. Neither side knows what types of units the other has, and both have blank chits, so all players are feeling hungry for real information about now. The French, with the advantage of positions on the high grounds to the N, start to spot the Italians as they come up the road. But gee, its a long way! What IS that little thing over there? Well, it's a little thing! An Italian L3/35 tankette, to be precise. Whipping up the road at a pretty healthy clip. Around the bend and into the town proper, and whoops! We have contact! Seems that chit that moved across the bridge at a leisurely infantry-pace was not an infantry unit at all, but a Panhard! POP! A quick shot rings out. No one knows exactly where that little projectile went, but if the Pan-pan hit anything, it was probably a few Km behind the L3. Or maybe the gun just mis-fired? Anyways, no harm, no foul, right? Well... no. The Italians don't seem to be in a forgiving mood. 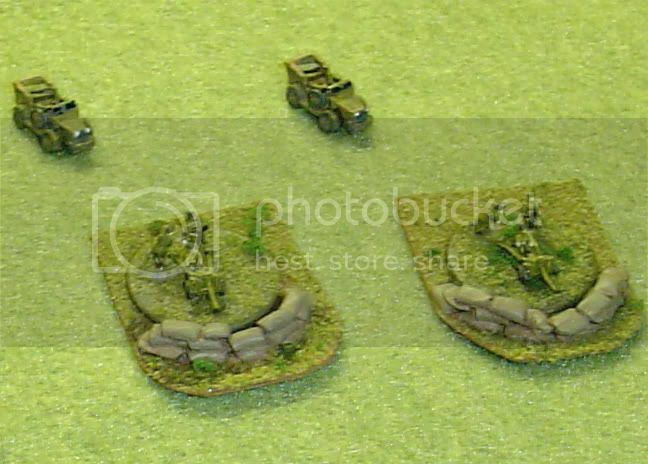 Twin 8mm MGs lay in to the Panhard, and in a hail of bullets the French crew is suppressed and their vehicle is immobilized. I think maybe the driver had his direct-vision block open, and caught one in the face or something. Seems that the village street is NOT a good place to park a Pan-pan. There are bunches of chits coming up the street. A small bunch of them come blossoming out of the Lancia truck behind the L3, and go charging along the the buildings on both sides of the street. 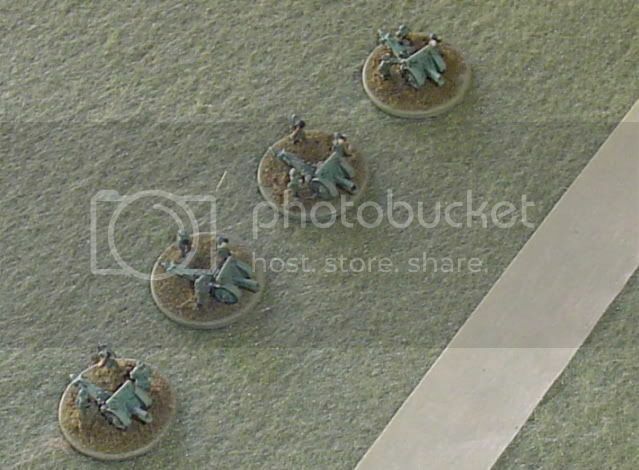 The Pan-pan manages to suppress one, an infantry team, when it gets to within "reaction fire" range. The L3 itself ducks out of the way, as do several other chits, to allow a bunch of bigger, nastier looking tanks to come clanking on up. Well, not exactly big and nastey, but if you drive Italian armor, an M11 is about as big and nastey as you're going to get, so might as well make the best of it! 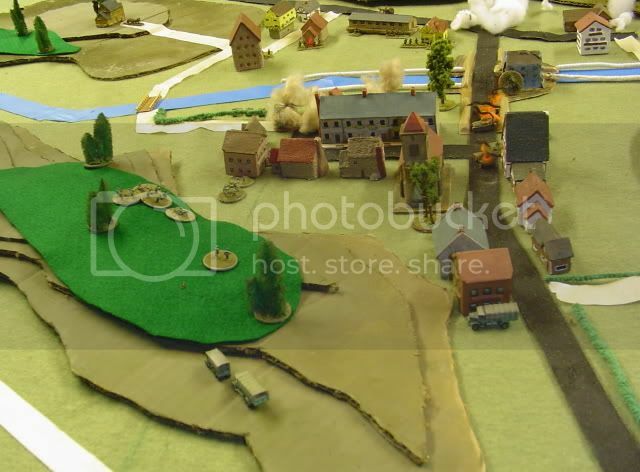 The Panhard stands in the street and fights a lonely battle, while other French units that crossed the mill bridge scatter off to the orchard hill (out of the picture) to the E of town, and units that came over the farm bridge move into the buildings on the SW side. The Italians, in the meantime, have had another stack of chits "blossom" out of transports, and move into the woods on the hill SW of town. Looks like the fight is going to heat up. The first to get cooked is the Pan-pan. After a brave but ultimately futile stand against the Italian infantry, it goes up in flames after multiple hits from Italian 37mm guns. 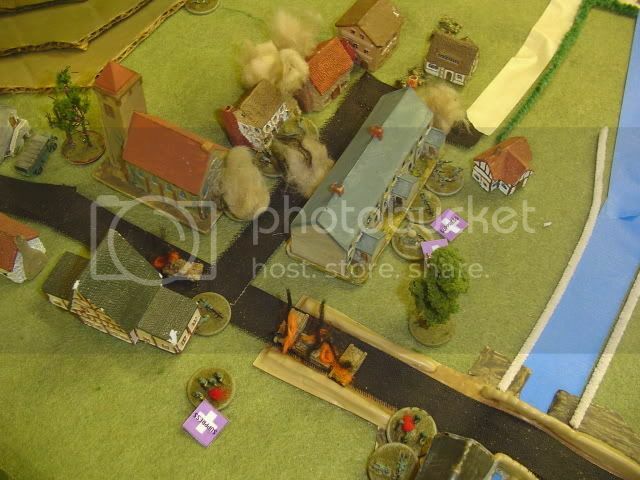 The death of their comrades in the town center seems to energize the French artillery. Because the center of town almost immediately becomes a ... how should we say it? ... "hostile" environment. In the meantime, it appears that the chits that moved off to the orchard hill were the remaining Panhards. This is noted when they suddenly roll into view near the water tower by the orchard, to the E of the Italian force. However, the Italians too have some big guns in their back pockets. The remnants of the Panhard platoon are soon feeling the heat. And so they scamper away to the E and N to get the orchard between them and the attention of the big boys. 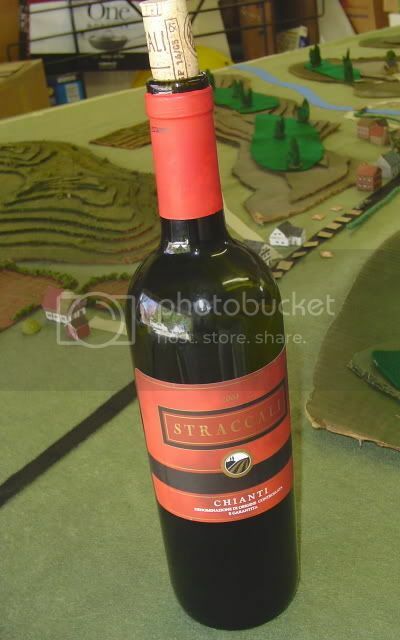 Here we can see the Italian attack really beginning to develop. 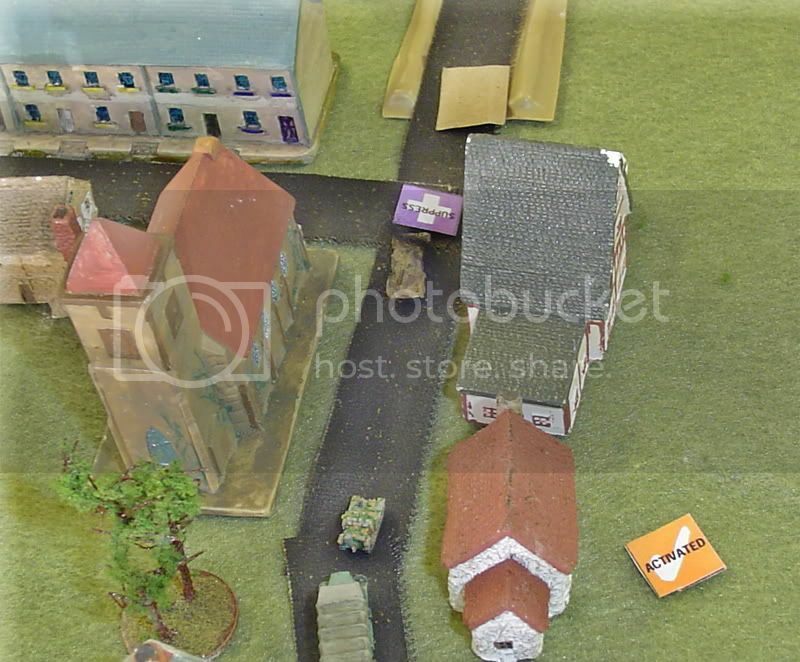 The L3s have crossed over the join the infantry company's 45mm mortars in providing support for the third platoon as it assaults the town from the SW. The thin French screening force in this area can hardly fall back quickly enough, and French casualites mount quickly. In the meantime, the L11s are moving up towards the mill bridge, with two platoons of Italian infantry trying to move up with them. 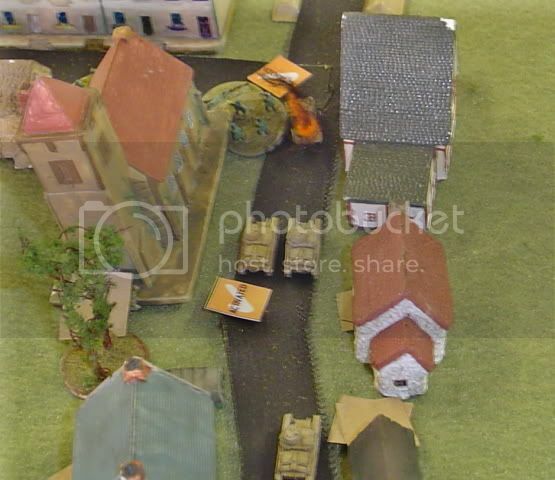 Except that small issue of the French 75mm shells falling on their heads seems to be holding them back a bit. 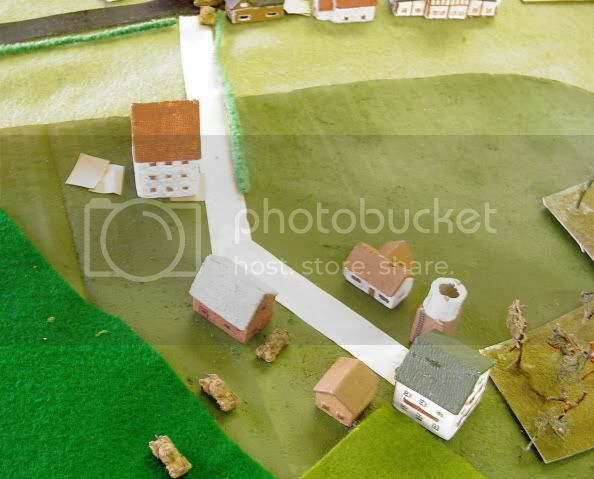 The French infantry can now be seen firing from the windows and doorways of the buildings on the N side of the stream. The Italian artillery begins to lay a smoke screen, as they begin to move forward in preparation of storming across the bridges. But even as the Italians advance at their confident (if somewhat lethargic) pace, the French have not been passive. The Panhards have not run away, but have re-positioned themselves, and slowly creep up through the orchard on the E hill. 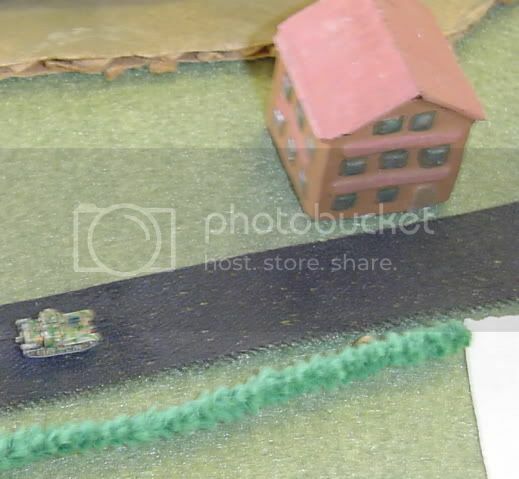 25mm gunfire erupts from the Orchard, and the Pan-pans are back in action, knocking off one of the M11s, and forcing the remaining tanks to turn and engage them. 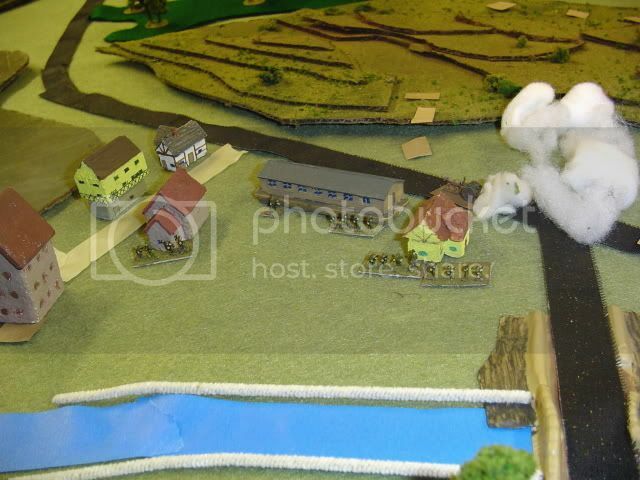 In the meantime, the Italian infantry advancing along with the M11s is engaged by long-range small-arms fire from the ridge to the N of the stream, which causes casualties and drives the Italians to ground at just about exactly the wrong place. Oh great. 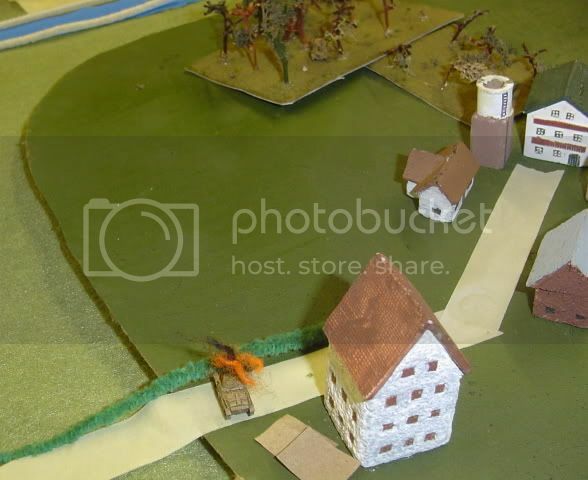 Artillery dropping all over them in town, now rifle and MG fire dropping them all over outside of town, and armored cars dualing with their tanks at the bridge. What next? More bad news is what's next! One of the Pan-pans has snuck through the orchard until he spotted the M11 company commander, and then killed him in one shot! This causes an interesting shift in the dynamics of play. 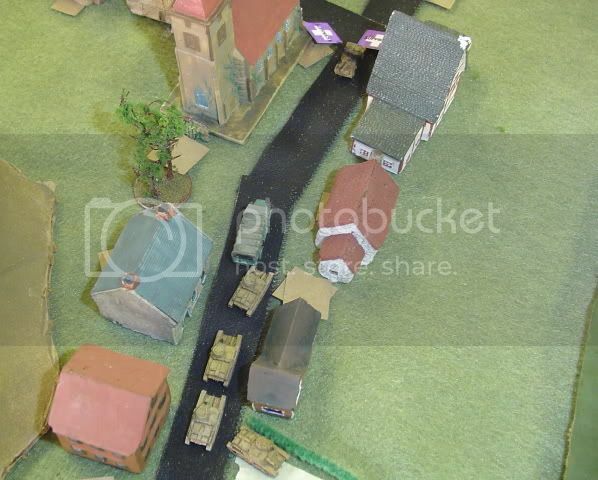 The Mein Panzer rule set provides for activation by "unit". I was activating more units that Harold, and so had the ability to activate two parts of my command to his one on the first phase of each turn. But with the loss of this unit, I lost one of my activations. So I lost a good deal of my ability to set the pace for each turn. One could say that the initative really shifted on this particular turn. Ouch. Well, at least, if you look to the W side of town, you'll see that the Italian infantry and L3s have continued advancing. It seems that the L3 is actually a wicked little platform against infantry, so long as you keep it just out of close-assault range. And now the Italian artillery shifts targets from its smoke mission, and manages to drop a world of hurt right on top of the Pan-pans. 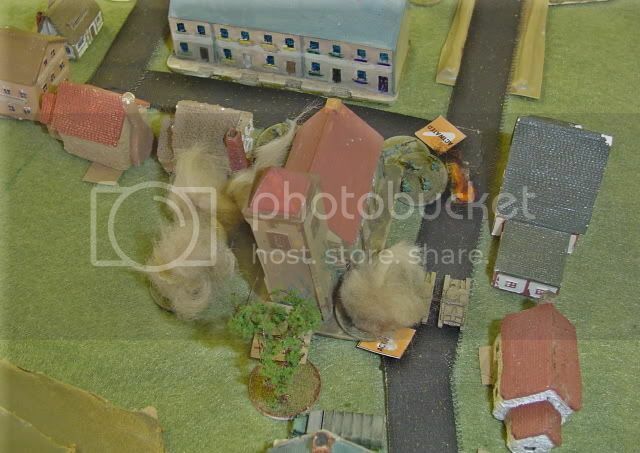 Orchard branches fly, and one big burst right on top of a Panhard sends it up in flames. 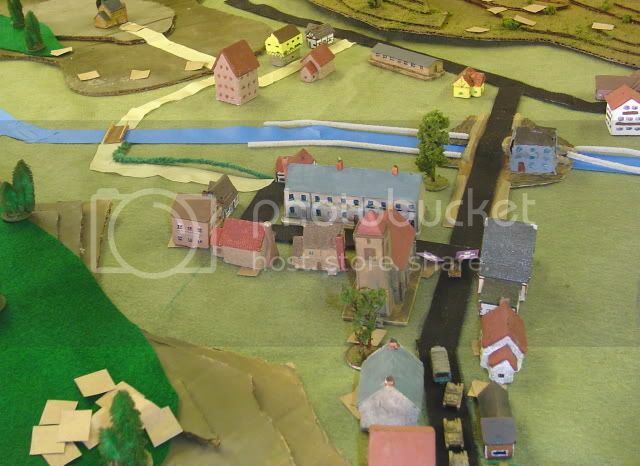 The French are re-inforcing their river line, with even the company HQ moving up to join in the fire fight. Leaving their HQ vehicles on the blind side of the hill, of course. The CO wouldn't want anything to happen to his little Peugeot staff car, now would he? 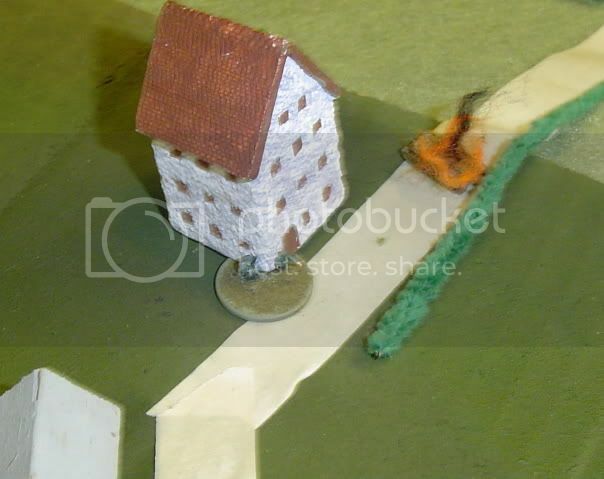 The Italian HQ finds that their Brixia 45mm mortars barely have the range to reach the town itself, and have no chance of shooting to the other side of the river where the enemy are. Odd thing, that Italian mortar. It is outranged by small arms, which makes it a particularly hazardous support weapon to try to use! The game had now reached a stalemate. 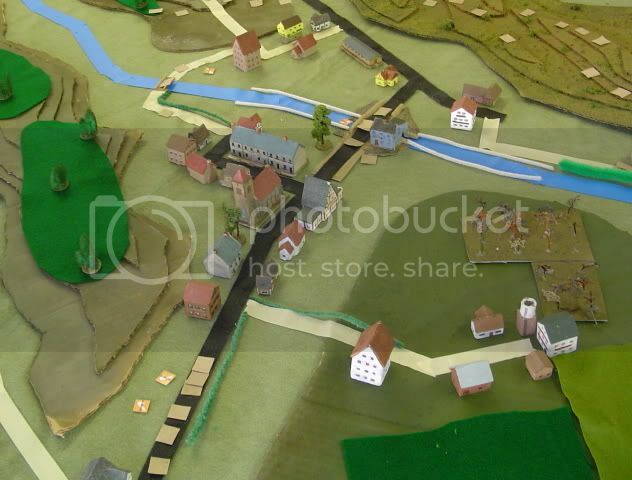 The Italians held the village proper, but did not have the forces to cross the stream. The French infantry on the river line would be in great danger from the L3s as the firefight wore on, except of course that the L3s were in great danger from the two remaining Panhards ... if they could ever find positions for another round of shooting up Italian tanks. But the real contest from this point forward would have been a dual of the artillery. Throughout it all, the Italian AOP team watched the whole show from their position in the inn on the orchard hill. They watch the whole Italian provisional tank company get wacked, and can even feel the heat from the CO's tank as it burns below their window. They had a perfect perch for calling fire on the French river line. The French AOP sits comfortably on the hillside, calling fire from his field phone. He can't move, or he will loose his connection. So he can only shoot at what can be seen from this one position. But it has turned out to be a pretty good position, as he can see most of the town and both bridges. The Italians would dare the bridges only at great risk. And besides, the wine was too good to stay mad at each other for long. What was this fight about, anyways? So this is where the battle ended. This was a real slug-fest. The rules played well for this size of battle. 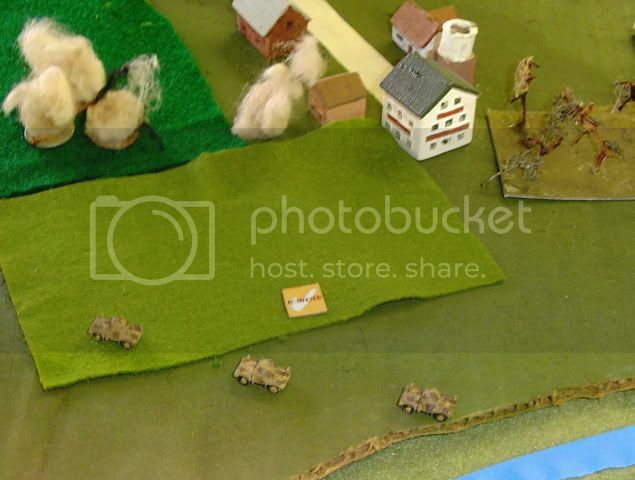 We had a lot of maneuver, a lot of infantry, armor, and artillery all in action. It never felt to me like it was bogging down or dragging. About 20 or 25 stands per player was reasonable ... I think a player could reasonably go up to 30 or a few more if he was a bit more familiar with the rules (which comes with experience), and he wasn't game-mastering and running artillery too. The combined arms nature of this battle was quite rewarding to me. In my experience, so much of micro-armor gaming winds up being tanks-only, which leaves a real false impression of the value of light armor. In this battle, my L3s ROCKED! Watching them go through the west side of town, crushing the (admittedly thin) French infantry stand-by-stand, you really got some insight into why so many armies went in for the twin-MG light tank in the inter-war years. A Pzr 1, or a Mk VIb, would have faired just as well. A Matilda 1 would have been an interesting site as well. This is just a gratuitous picture. Harold didn't chose to use my 25mm ATGs. I really like the way the sand-bag emplacements came out, and I also just love my little Laffly combat cars that tow them, so I'm tossing this picture in just to close on a high-note. I hope you all enjoyed the story and pics. Now its time for you guys to post some of your own up. You know you want to. And we would love to see 'em! Great report Mark1 - that really hits the spot! Very interesting choice of scenarios too! 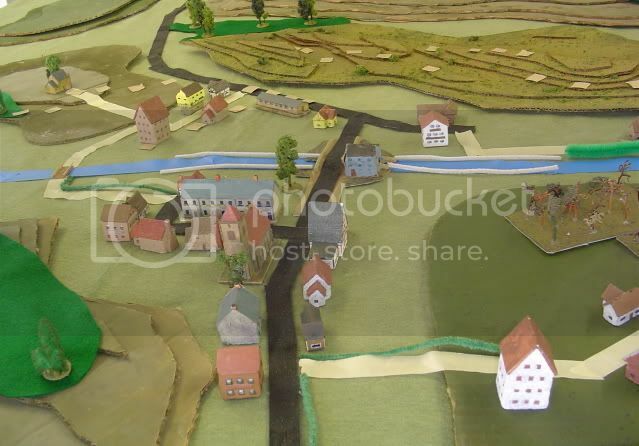 Crossing the pontoons at Fredricksburg in 10mm ACW Figs - buildings are Old North State and Starfort. 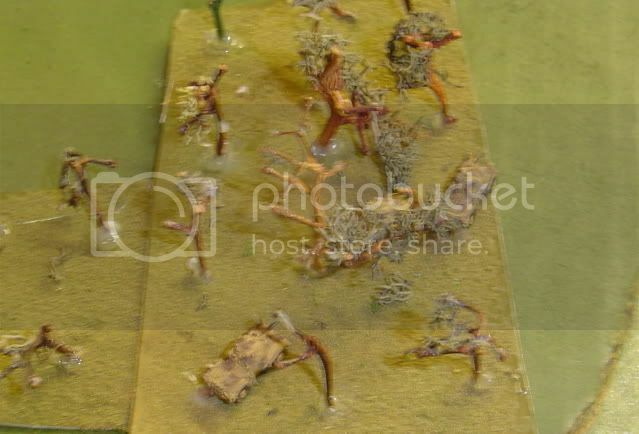 Pontoons scratch built and figs a mix of GHQ and Pithead. 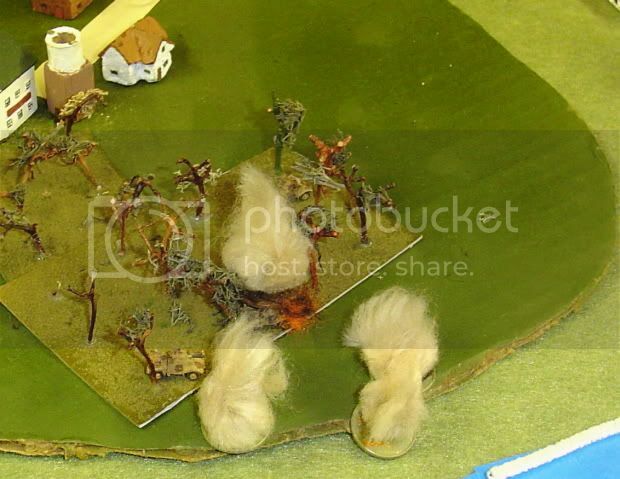 Confederates firing at 4th Corps on Shy's Hill south of Nashville - From my Hood's 1864 Campaign at Nashcon in 2005. More from Shy's Hill - Pic by my friend Mickey Bates. 23rd Corps awaits Cleburne's Divisional Assault at Franklin - another shot by my friend Mickey from Hood's 1864 Tennessee Campaign. More of Fredricksburg at the pontoons. Mk1 and ACWBill ,love yer stuff TOO!